This is a low-res jpg image only. For the full size pdf file, please register (free) and download from the Gallery. 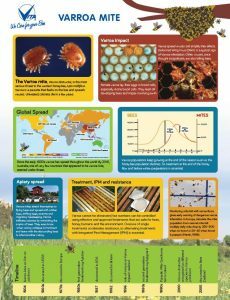 Vita has created an infographic about varroa. It’s free and downloadable from the Vita Gallery. 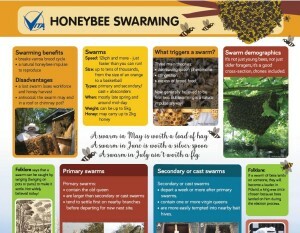 It is the second in an infographic series; the first was a Swarming Infographic. 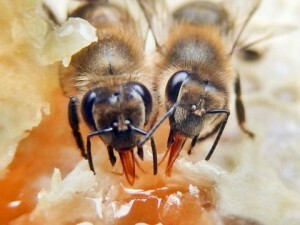 Photographers with an interest in honeybees and beekeeping are invited to enter the fifth annual Vita photo competition. Winners’ photographs will appear in the 2017 Vita Calendar and be featured in Vita’s monthly newsletters. All winners will receive a copy of the limited edition calendar and one outright winner will also receive a cash prize plus beekeeping products. The competition will be judged by an international panel of beekeeping specialists and suppliers. New research by Rothamsted has revealed the different gene mutations that have enabled varroa mites to become resistant to acaricides, including pyrethroids (such as the active ingredients of Apistan and Bayvarol). The findings have also helped explain Vita’s earlier observations about differing patterns of resistance across the world. Tau-fluvalinate is a pyrethroid that can kill vulnerable mites by overstimulating their nervous systems. It interferes with sodium channel proteins that are involved in generating electrical signals in nerve cells. 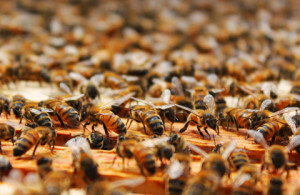 Earlier research showed that resistance to tau-fluvalinate in central and southern England evolved through a mutation of a single base in the varroa’s DNA. 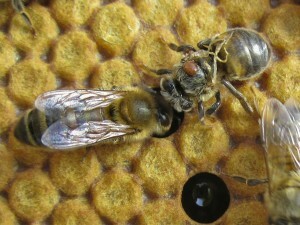 This latest research has shown that a different mutation evolved in resistant varroa mites in the USA. Dr Max Watkins, Technical Director of Vita (Europe) Ltd, explained: “In our ongoing studies of resistance to pyrethroids, we noticed that the pattern of resistance in the USA was different to that of the UK which was different again to that of continental Europe. We have long suspected that different mutations are responsible for these variations. Vita has produced a fun seasonal infographic about swarms. It’s free and downloadable from the Vita Gallery. Vita is also running a competition on its Facebook, Twitter and Google+ pages for anyone to win a free A3 poster version of the infographic. Vita’s 2015 international photo competition attracted the largest numbers of entries yet with submissions from people on five continents. The overall winner is Hamish Symington with his image of two bees, each with its proboscis extended, drinking nectar from comb. Fourteen entries will appear in the limited edition 2016 Vita Calendar distributed to Vita’s global network and the winners. Some of the photos are below and a pdf file of the full calendar is available for free download to users of the Vita Gallery www.vita-europe.com/beehealth/gallery.